As a frequent reviewer of Wi-Fi routers, I'm often asked, "How do I get rid of dead spots in my Wi-Fi coverage?" The best way is to add an Ethernet-connected access point. But often, running an Ethernet cable from your Wi-Fi router to the AP isn't feasible. Best Buy and NETGEAR have partnered to address this problem with the NETGEAR R7300DST Nighthawk DST Router & DST Adapter. The router is basically a NETGEAR R7000 Nighthawk with a built-in HomePlug AV2 adapter. The DST Adapter (DST stands for "Dead Spot Terminator") is a HomePlug AV2-connected simultaneous dual-band 802.11ac access point. The DST does not function as a wireless-connected extender. According to the published specifications, the R7300 Nighthawk is an AC1900 class router (600 Mbps @2.4GHz with 256 QAM support + 1300 Mbps @ 5GHz 11ac). NETGEAR's specs for the DST adapter say it is "HomePlug AV2 compliant" and has an 802.11ac AC650 (2.4 GHz: 300 Mbps + 5 GHz: 350 Mbps) radio. Don't go rushing out to Amazon.com to find this product, however. The Nighthawk DST AC1900 Router and DST Adapter was developed by NETGEAR for Best Buy and is exclusively sold and supported by Best Buy. Additional DST Adapters have their own model number—DST6501—and sell for $70. The R7300DST's body is the same width, but a 1/4" taller and 2" deeper than the original R7000. (Add 5.5" height and 1.5" depth for the antennas.) Callouts for both router are shown below. There are no slots on the bottom for wall / ceiling mounting. The top cover is solid, but all other surfaces are composed of open plastic grid for convection cooling since there is no fan. The top cover of the R7300DST does get warm to the touch. Note the Geek Squad button on the top panel. Pushing it allows Geek Squad techs to access the router settings. You must first access the Geek Squad via chat or phone and give them a coupon code found in the User Manual and Geek Squad Support ID found on the router serial number label. Geek Squad support is limited to setting up the R7300DST and DST6501 adapter, not general network support and is good for one year from purchase. We did not exercise the Geek Squad as part of this review. But let us know if you do via a forum post. The DST6501's callouts are shown below. The Gigabit Ethernet port can be used to connect Ethernet devices, but can't be used to connect the DST's access point via Ethernet instead of HomePlug. The router has a pretty clean layout with all key circuits encased in RF cans. Because the R7300DST has a built-in powerline interface, it has a built-in power supply (photo right) and connects via an AC line cord. Removing the board reveals a large heatsink plate that couples to the bottom of the router via thermal pads. Here's the main board with RF can tops removed. The 2.4 and 5GHz radios are on the left. The lone component in the right side RF can is a BCM54612E Gigabit Ethernet transceiver used to connect the powerline module. The board bottom view reveals the Broadcom BCM4709A processor with built-in Gigabit Ethernet switch, RAM and flash. Table 1 below summarizes the key components of the NETGEAR R7300DST and components of the other two products that we'll be using for comparison in the performance section of the review, i.e. the original R7000 Nighthawk and Linksys WRT1900ACS. 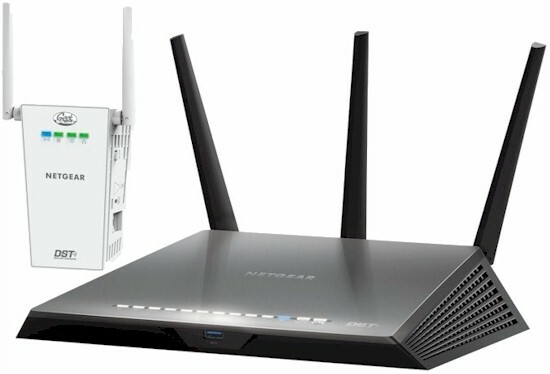 Both NETGEAR routers use the same components. The Linksys router is Marvell-based. For comparison, here's a photo of the top of the NETGEAR R7000's board, which the R7300DST's board takes many design cues from. Finally, the image below shows a closeup of the powerline module that appears on the right side of router chassis in the first two inside photos above. We didn't disassemble it to identify the powerline controller. But it's a good guess it's the same one used in the DST, which we'll look at next.